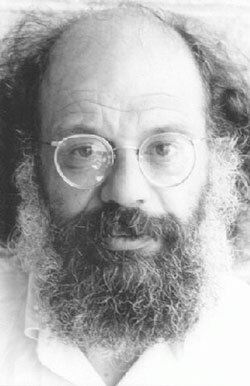 Allen Ginsberg is probably one of the best known contemporary poets in recent history. He was born in 1926 in Newark, NJ and recieved his B.A. from Columbia University in 1948. Like many other artists, Ginsberg held a variety of odd jobs before becoming an established writer. His employment history includes work on various cargo ships, a spot welder, a dishwasher and he also worked as a night porter in Denver. He has partcipated in numerous poetry readings, including the famous Six Gallery event that occured in San Francisco. In 1954, San Francisco painter Robert LaVigne introduced his model and companion, Peter Orlovsky to Ginsberg. Soon after this first meeting, Orlovsky and Ginsberg became lovers and moved in together, defining their relationship as a marriage. Despite periods of separation, this arrangement remained intact until Ginsberg's death in April 1997. Ginsberg was the recipient of numerous honors and awards during his lifetime including: the Woodbury Poetry Prize, a Guggenheim fellowship, the National Book Award for Poetry, NEA grants and a Lifetime Ahievement Award from the Before Columbus Foundation. In addition to the almost epic poem Howl, Ginsberg has authored numerous books, too voluminous to mention here. Many of his writings were interpreted as contrevertial and even obscene. The reading of Howl resulted in the arrest of Lawrence Ferlinghetti, the owner of City Lights Books, on obscenity charges. The authorities objected to Ginsberg's openess concerning his homosexuality as well as the graphic sexual language. Many of his other writings deal with subjects such as narcotics and the experiences on has while under their influence. However, many other prominent writers, including Jack Keroauc, William Carlos Williams and Kenneth Rexroth, realized Ginsbergs importance. Ginsberg was greatly influenced by Keroauc's spontaneous and carefree style and often worked in a "stream of consciousness" manner until he completed a work. Ginsberg also once, influenced by Williams, arranged some of his poems "according to how you'd break it up if you actually to talk it out" and the latter was greatly impressed by the feat. Like many of the writers of his period, Ginsberg had a desire to attain the mystical. The metaphysical poets of the nineteenth century, including William Blake, were perhaps his greatest influence. It was the desire to expand the mind and reach the spiritual that inspired Ginsberg to experment with substances such as marijuana and Benzedrine. He claimed that many of his writings, including Howl were written while he was under the influence of drugs. Ginsberg's theme of politics was once described by Rexroth as "an almost perfect fulfillment of the long, Whitman, Populist, social revolutionary tradition in American poetry". Many of his writings contain a war motiff: subjects such as the Nazi gas chambers and Viet Nam are the topic of many of his poems. Ginsberg is perhaps one of the most respected and revered Beat writer's. His work is definitely worth a glance even if the writers of this period are of little interest to certain readers. After his recent death, City Lights had a celebration of his work which included the playing of some of his taped readings. Ginsberg's writing has been compared to Thoreau, Emerson and Whitman and has been said to contain "that old gnostic tradition".